Failing to align on marketing and sales strategies leads to wasted efforts, execution mishaps and lost business opportunities. Yet according to SiriusDecisions research, only 37 percent of b-to-b organizations would say there is overall marketing and sales alignment, and nearly one-third of sales organizations estimate they lost at least one month of productivity re-evaluating their account territory assignments after the start of the year. Tune-in to learn industry best practices for aligning sales and marketing to drive demand in an account-based buying environment. Discover tips for leveraging technology to gain actionable insights on accounts, focusing prioritization efforts to rapidly scale ABM efforts. You’ll also hear first-hand how to create an aligned ABM strategy that drives measurable results like faster time to engagement, larger deal size, and higher win rates. Research says that 67% of the buyer’s journey is now done digitally (SiriusDecisions). This does not go to say that sales is not involved whatsoever during this process, but what this statistic tells us is that there is a lot more research going on in the dark that we don't know about. Meaning... sales could be missing a lot of potential deal opportunities. Sales has essentially lost control of the buying journey since everything has started to move digital. What if we told you that you can gain your control back? What if we told you that you can get in at the right time, win more deals, and at a larger value? Truth be told, nobody really controls the buying journey except for the buyer, but through the right coordination, ABM can help sales and marketing teams better align with the buyer’s journey and get in the door sooner. The key is here is to develop an ABM approach and focus on the right accounts at the right time. Where does one even get started? That’s what we’re here to help you with. Building an ABM strategy with Rob Israch, CMO at Tipalti and Srihari Kumar, Chief Commercial Officer at 6sense. With today’s overwhelming marketplace of vendors, trying to find one solution is like trying to find a needle in a haystack. Several different moving parts, multiple contracts and overlapping end dates, and a constantly changing landscape – if only you could stitch them all together. What if there was a platform that’s already done that for you? Tune in with Nick Ezzo, VP of Demand Gen at Sage Intacct along with Srihari Kumar, Chief Commercial Officer at 6sense, as they discuss the benefits of consolidating your marketing tech stack from several point solutions into one, and the value brought to the table in working with one integrated, consolidated platform. One platform designed to drive more qualified pipeline, increase ACVs, shorten deal duration and close more deals? Sounds like you might have found that needle. Following a recent analysis of predictive marketing vendors and the publication of The Forrester Wave: Predictive Marketing Analytics for B2B Markers, join us for a webinar featuring guest speaker and Forrester senior analyst Allison Snow to learn more about the trends in the predictive industry and what she sees in store for the future. Additionally, 6sense VP of Product Amar Doshi, will discuss how B2B marketing and sales teams are being transformed through modern advances in data science to deliver complete omni-channel buyer visibility, highly converting pipeline and measurable proof of ROI. In this webinar for sales and marketing, join us for a discussion on the steps you should consider to implement the new B2B Next Generation Demand Waterfall® that Kerry Cunningham and Terry Flaherty covered in this year’s SiriusDecisions Summit keynote. We will cover these topics while referencing examples of organizations who are aligning their demand centers and sales teams to this approach such as Cisco, Netsuite, PGi, Arkadin, Panasas, Lenovo, Dell, Box, Qlik and others who have implemented the Next-Generation Demand Waterfall and witnessed success across the entire funnel, including increased pipeline, optimized spend, higher win rates, larger average deal sizes and improved campaign efficiency. The value of search in B2B marketing is beyond question. Marketers spend massive amounts of time and money on selecting, revising and purchasing keywords in an effort to drive visits to their website, raise brand awareness and influence buying decisions. For marketers who want to reach their target buyers during the pivotal first moment of research, being able to understand, harness and measure online research and search data is no longer negotiable. But staying up-to-date and on top of the ever-changing world of search marketing is no easy task. Join BusinessOnline and 6sense as we discuss how marketers can use search as a key tactic in their arsenal and leverage online research to power their account-based marketing and sales efforts. For B2B marketers looking to regain control in an increasingly digital and programmatic world, marketing analytics technology has proven to be a powerful enabler. With marketing budgets ranging from the high thousands to multi-millions, marketers rightly continue to focus on driving the customer experience to compel engagement and, eventually, convert business. Unfortunately, marketers are only able to track, measure, and derive data value from less than 10% of that spend. This leaves B2B marketing with ‘The 90% Problem:’ when there’s a greater percentage of buyers participating in a marketing campaign than those who ever actually raise their hand. While this audience consumes 90% of a marketer’s budget, time, and effort – and also plays a significant role in a buying decision – their anonymity makes it difficult to take advantage of the data and analytics that can inform marketing and sales strategy in a more comprehensive, efficient and cost effective way. 1.An introduction to The 90% Problem, and how marketers and marketing technologies are solving it. 2.How The 90% Problem impacts predictive analytics and what it means for the future of marketing analytics. 3.Tactical next steps B2B marketers can take today to set their companies up for a successful data-driven tech stack. Even the journey to a $3-million-dollar deal starts with an online search. That’s just how important online search and B2B centers of research have become in the day-to-day lives of professionals. So it comes as no surprise that for most marketers Search Engine Marketing (SEM) represents their largest marketing investment. The problem with SEM is that – even when prospects are searching for a solution you deliver - only a tiny fraction of this audience ever click on your ads and an even smaller fraction ask to be contacted by sales. We’re very excited to announce the launch of our brand new product, SearchSense, built on the 6sense Predictive Intelligence Platform to help marketers and sales professionals develop and hone their ABM lists. SearchSense uncovers which accounts are actively searching for your keywords and allows you to optimize your marketing and sales campaigns based on search data. Join us to learn how SearchSense can help ensure that your 2017 ABM campaigns target the right accounts. Learn how Cisco is powering its digital efforts using predictive intelligence. Joseph Puthussery will share Cisco’s path to building a modern revenue engine and what the future holds for the data-driven enterprise. Are you in the middle of planning out your 2017 budget and interested in learning how predictive intelligence can help you hit your pipeline and revenue goals? This webinar will explore how predictive intelligence improves the targeting and conversion rates of your digital marketing and demand gen activities and increases the relevancy and quality of leads you pass on to Sales. We will also discuss the business processes and due diligence every company should go through before investing in predictive intelligence. -building implementation teams to increase your chances of a successful rollout. You’ll walk away from the presentation better prepared to make the right decision this year to take advantage of predictive intelligence in 2017.
Business leaders recognize that marketing can deliver huge benefits to their organizations by building a deep understanding of their customers – who they are, what makes them tick and the challenges they face. Enabling sales teams with this intelligence allows account executives to have better-informed conversations that focus on delivering value to the customer. On the marketing end, customer intelligence helps create experiences that better serve the wants, needs and habits of your prospects. -personalize your digital properties to improve customer experience with the goal of building pipeline and revenue. Today’s Chief Marketing Officer will soon be unrecognizable form the marketing leaders who came before. The modern range of marketing responsibilities now encompasses: a deeper understanding of customer needs and behavior; the ability to collect, analyze and operationalize customer data; and, alignment with sales and direct impact on pipeline and revenue. 1.The collection, management and analysis of customer data. 2.Continuous review and piloting of new technologies. 3.Cross-functional alignment with sales, customer success and product to drive a superior customer experience. 4.Metrics and measurement that deliver visibility into attribution and marketing impact on business priorities. 5.Building the capabilities and processes to allow data-driven customer-focused decision making drive marketing and sales execution. In the past, the only ways marketers knew they could reach customers in one-to-one marketing was direct mail and email. Quietly and without much fanfare direct marketing has gone through a powerful revolution. Driven by new technologies and an explosion of accessible customer data, marketers can now reach prospects in one-to-one communication through social, display, native, search and video. This practical, how-to session will explore the main use cases and opportunities of direct marketing and what technologies and processes are needed to take advantage of them. Join Amy Michaels, Head of Direct Acquisition at T-Mobile US and Amar Doshi, VP of Product at 6sense as they discuss how new techniques, technologies and marketing channels will define the next generation of business growth. Account-based marketing has been top of mind for leading B2B enterprises as a strategy to increase effectiveness of marketing spend and investment in brand-to-demand programs. In just over a decade, 60% of companies with over $500 million in revenue now leverage marketing automation platforms like Marketo to manage the B2B buyers journey and drive pipeline. In parallel, predictive intelligence has reached a point of sophistication where time-sensitive data-driven methodologies can be used in B2B marketing. This coupling of two critical pieces of marketing technology can help marketers accelerate the sales process while increasing efficiency of account-based marketing effort. B2B marketers are quickly embracing an account-based approach to generating demand and building pipeline. The change is being driven by a closer alignment with sales (which sells to accounts not leads), a demand for higher ROI (which can be achieved through better targeting) and a desire to deliver personalized, customer-centric interactions (which are built on understanding account needs). - what is account based marketing? We’ll conclude our conversation with a discussion of actionable next steps that can help you implement a predictive-powered account based marketing strategy. As we wrap up 2015 we wanted to take stock of this transformative year in marketing. To help us, we asked 4 of the top minds in B2B marketing a question: what are the biggest ideas that will impact the world of B2B marketing next year? And we’ve asked them to give us an answer in 8 minutes or less. So please join us for an amazing round of lightning talks. At the conclusion of the webinar we’ll offer all the attendees early access to all 12 keynote presentations from this year's INmarket15 conference, including presentations by Forrester and Cisco. How would a B2B intent data aggregator, a modern media agency and one of the most recognizable B2B publishers build a marketing engine to target, engage and convert your prospects with precision and accuracy? 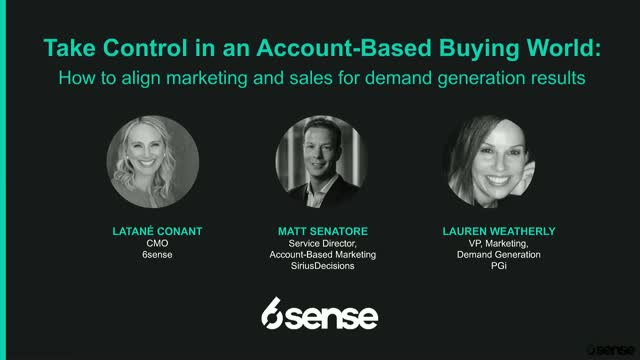 6sense is bringing together Bombora, DWA and Forbes to explore how data and predictive intelligence technologies can connect what is currently 3 silo-ed areas of media campaigns. - What is intent data and how can it be leveraged in your marketing strategy? - How predictive intelligence can create feedback loops that target your content marketing and display advertising dollars for the greatest effect. - How access to B2B intent data is changing the way the media planning and publishing industries operate. - What you can start doing today to prepare to take advantage of the latest B2B marketing strategies. Join us as we turn our attention attention to the future of B2B marketing. Is it true that technology can now empower your sales and marketing teams with the ability to predict the buying patterns of prospective clients? As our world evolves into a technology-driven society, your consumer’s digital fingerprints are everywhere. Predictive marketing systems claim they can predict your next customer by mining these purchasing cues from digital behavior. Can this technology really tell us who will buy, what they’ll buy and when? Join host David Lewis, CEO of DemandGen as he interviews Scott Broomfield, CMO at Xactly and Zak Garner, Director of Customer Success at 6sense to understand how firms like Xactly use 6sense's predictive intelligence solution to gain insights of future buying patterns. Predictive intelligence gives companies the ability to identify in-market buyers early in the buyer’s journey, increasing conversion rates and growing revenue. Both sales and marketing are eager to implement predictive for their teams, but many are unsure of where to start. Join us on September 10th at 9am PT for this live webinar and learn how to empower your marketing and sales teams with predictive intelligence. Live monthly webinars for B2B marketers. Everything predictive from education to implementation to ROI.